Product prices and availability are accurate as of 2019-04-19 14:20:26 UTC and are subject to change. Any price and availability information displayed on http://www.amazon.com/ at the time of purchase will apply to the purchase of this product. AutoLoc Locking Bear Claw Latch Set comes with great appearance and unsurpassed strength. The dual claws and extra-large striker-bolts give AutoLoc's locking bear claws awesome gripping strength and rugged good looks. Each bear claw latch features an all-steel mechanism and a lifetime guarantee. 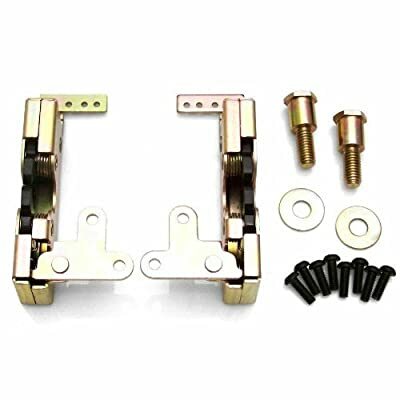 Besides being the strongest, tightest latches on the market, AutoLoc bear claw latches are perfect for doors with shaved handles because of their lever-action triggers, three stage latching system, and five coil steel springs, which allow bear claw latches to generate over an inch of throw on many types of doors. All bear claw latches come with a limited lifetime warranty.